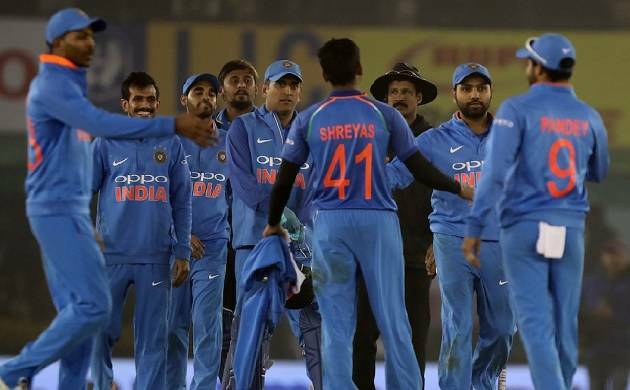 India vs Sri Lanka, 3rd ODI Live Score: India would like to continue its unbeaten run of bilateral series against Sri Lanka at home as they lock horns for the third ODI at fortress Visakhapatnam on Sunday. India has done well to restrict Sri Lanka to a below-par score of 215 in the third ODI at Vishakapatnam. The Indian bowlers came back brilliantly in the match after Upul Tharanga and laid down a solid platform. The Indian spin duo of Kuldeep Yadav and Y Chahal ran through the Sri Lankan middle order before Hardik Pandya polished off the tail. Indian skipper Rohit Sharma won the toss and elected to bat first “keeping the due factor in mind” in the series decider. India has made one changes in the team and Kuldeep Yadav has been included in the side after Washington Sundar fall ill.
# Fifty for Tharanga, his no. 36th in ODIs. He is looking very dangerous today. # FOUR, FOUR, FOUR, FOUR and FOUR. Five in a row. Tharanga is firing all cylenders here. 20 runs off Hardik Pandya's 2nd over. # Bumrah to Gunathilaka: OUT caught by Rohit. Sri Lanka one down early. # 0.3: B Kumar to D Gunathilaka (4), 4 runs, Gunathilaka fires it like a bullet. # India have won the toss and decided to bowl first.